A couple more videos if you're interested. I went for a short holiday by the beach this week, so in the background you can see the Australian coast near Apollo Bay, 3hrs outside of Melbourne. Sorry - will fix it when I get home. Ok guys, the videos are fixed now - sorry about that, and @Rob MacKillop , thanks for alerting me. I hope you enjoy them!!! Wow, nicely done Jon, thanks. Nice venue as well. Is that in Australia? Looks like some nice surfing in the background. Very good, Jon. Love your internal rhythm that just keeps going through both pieces. Inspiring. Thanks for uploading them. Is this your 79 Favino? 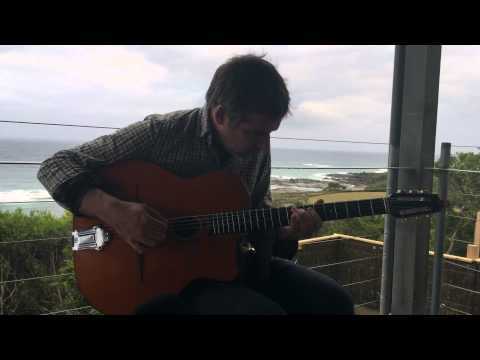 @Rob MacKillop thanks very much - it is the Favino, yeah - with some very crusty strings on. I think sometimes when it's like this, and the strings feel really disgusting to play, it can actually sound really great - sort of hollow and dead like an oud or something. This is kind of the closest I've gotten with my home setup to the sound I want out of this guitar, which is funny, as it's a very quick stereo setup (2 SM81s in XY) on a very windy, pretty rubbish day, outdoors - not ideal by any stretch of the imagination! Really nice playing, Jon! And a great sound! Wow, Apollo Bay is about as far south as you can get without being on King Island or Tasmania. Yes, I imagine you guys get some weather/surf there but I bet it is an amazing place to live.